When it comes to using wood shutters and doors in a bathroom there are a few things that you need to consider; privacy, ventilation and humidity. Privacy in a bathroom is obviously important to many people. 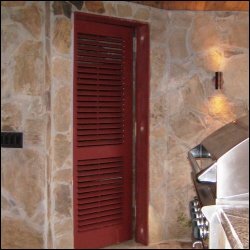 Most styles of doors or shutters will offer some degree of privacy. 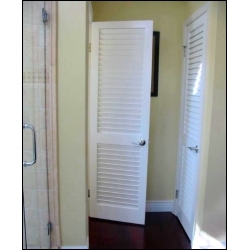 Louvered Doors offer line of sight privacy while solid interior doors with raised or flat panels, tongue & groove or even frosted glass have the added benefit of sound insulation. 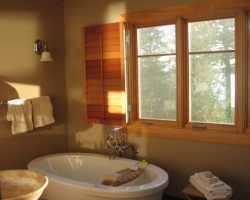 For bathroom windows operable louvered shutters have always been a favorite. They can be adjusted to allow as much light in as you want or closed for privacy. How much and what type of privacy you want is up to you but can also depend on whether you need ventilation. In some cases ventilation is required. If your bathroom has an air return for central air conditioning then you need to to have a bathroom door with ventilation so that when the door is closed the air condition functions properly. Check with your a/c service company to see how much air flow you will need. If you want a door that has privacy with a bit of ventilation you may want to consider some of our combination doors of tongue & grove with louvers. If it is a full bathroom then you may need to contend with a build up of moisture from a shower as well as water spray landing on the shutters and doors. Having interior shutters and doors that are properly painted and maintained will help prevent any water damage. A better choice is to use wood shutters and doors that are made from Spanish Cedar which is what we use for our exterior shutters and doors. Yet another option is to go with our Faux Plantation Shutters which will not be affected at all by the moisture and also resists bacteria which could form in the bathroom. If you are not sure which designs of interior doors or shutters will work best for you please ask us. Give us a call, send us an email or start an online chat. We are happy to help.